This is a low cost 2 person light weight (5 lbs) waterproof aluminum pole tent that is a great value for a very good backpacking tent. In a survival situation, you typically need as much protection from the weather as possible, and a tent is ideal when you want to set up camp. This two person tent is waterproof, the zippers all work well, and the ventilation is excellent. It is easy to carry as it only weighs 5 lbs. It withstands wind very well, and has a stuff sack that measures approx. 23" L x 7" in diameter. This tent can be assembled quickly (in less than 15 minutes). The Full Coverage Rainfly has 1500 mil Waterproofing and attaches with buckles so it stays secure. The tent has a loop for attaching a lantern inside the very top. It has a gear loft and 2 mesh pockets to keep your smaller gear accessible and above ground. The Ledge Sports Scorpion 2 Person Light Weight Aluminum Pole Backpacking Tent is a great value for a very good tent. To improve this tent, there are better tent stakes available such as the Vargo Titanium tent stakes. There are six guy lines to tie down the tent so this tent requires six stakes. Also, to better protect the floor of this tent, a footprint for this tent can be ordered from LedgeSports.com or you can use a 5' x 7' tarp underneath the tent. The following is a review and setup demonstration of the Ledge Sports Scorpion 2 Person Light Weight Aluminum Pole Backpacking Tent. The following is another review and setup demonstration of the Ledge Sports Scorpion 2 Person Light Weight Aluminum Pole Backpacking Tent. "This tent is great. was surprised that it came with its own compression sack. The poles break down shorter that most other tents that I looked at. It comes with reflective guy ropes, has a few different reflective places where the guy ropes are attached, the fly has buckle clips that attach it to the corners of the tent and it comes with light weight aluminium stakes. The placement of the zippers for the fly and tent are a whole lot more convenient than our last tent. We already took it out on a hiking trip!!! well worth the money." "We will be heading to Europe for a week long camping trip and squeezing two people into a 1 man tent was simply not going to happen. Despite the small amount of reviews we decided to give this tent a shot and I am glad we did. Setup: First know that this tent does not include instructions, but set up is so simple you cant possibly mess it up. It will take two people to set this ting up as the tent poles are extremely tight when put into their grommets. All that aside though, a first setup for a tent this size took us about 10 munites. Now that we know how it is set up, it should take us about 3 minutes. Size: This tent is amazingly roomy when set up. There is enough room for two full sized adults, both gear packs (which are very large) at our feet as well as sleeping pads. You may need something a little longer if you're near 6'4" but it fit me comfortably and I am 6'2". Packed up this thing is amazing! it comes with adjustable straps on the bag so you can really compress it down to a small size. My small sleeping bag takes up more room than this entire tent. Quality: Overall I feel this tent is made with quality materials. The bottom seems a tiny bit thin, but not enough to be worried about it. The poles are very easy to use and extremely high quality and they all line up flush when assembled. 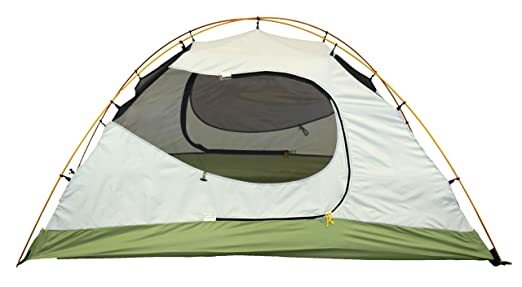 The one down side (-1 star) is without the rain cover on the tent it is virtually transparent looking in from the outside. The rain cover is very sturdy and easy to put on however and it will always be on most likely for our excursion. I will return and edit this for weather resistance and how well it holds up when we return from our trip. If you're on the fence about this tent or one of the more inexpensive ones I'd say choose this tent. Additional notes: I cant get enough use out of this tent. It makes traveling overseas much easier due to its small footprint and lightweight design. It held up to a massive rainstorm without a single leak. When we arrived it was already raining and having a tent that sets up this quickly was a huge plus! I see getting many years of use out of this tent at the festivals i attend overseas as well as general camping trips."